Good Blogs is a weblog network that creates “distributed communities of bloggers who actively promote each other every time readers visit their blogs.” Basically, you sign up, install a widget on your blog site, and Good Blogs directs fresh eyes your way. And as every blogger knows, whether you’re doing it for pennies or for fun, every new visit further validates the ego trip. Tell Me Something Good: Using The Good Blogs Explorer, you can pull down blog posts from 25 categories—Technology, in this case—or you can get weblog posts covering a variety of subjects by selecting All. The Good Blogs Explorer app for the iPhone and iPod touch is the Good Blogs concept stripped down and simplified to a fault. The idea is if you’re looking for something novel to read on your handheld, Good Blogs can point you in interesting new directions. And that it does. But the app doesn’t function as well as the concept. What’s best about Good Blogs? The content. Obviously, not all weblogs are created equal, but you may discover a few hidden gems as I did. Good Blogs lets you browse blog posts from among 25 categories, including art, health, international, life, science, technology, wine, and writing. Using the app’s scroll wheel, you can select “all,” and get a smattering of posts from the Good Blogs universe, or pick just one to keep the sample of 10 posts a bit more focused. The app will display a list of posts accompanied by a cute emoticon that seems to bear no actual relation to the tone or tenor of the blog with which it is paired. The graphics seem to be there simply to break up the text, which is fine. If you see a headline you like, tap it and a summary will pop up. If you want to read the rest of the post, tap the Browse button at the bottom right of the screen, and Good Blogs will launch your device’s Web browser. What isn’t so good about Good Blogs? The topics, while diverse, are not ideal. There should be more. How many more, I wouldn’t presume to say. But as with sites such as StumbleUpon or Alltop, the topics should be dictated as much as possible by the reader’s interest; the reader’s interest should not be dictated. The topics are oddly limited. When I’m not reviewing iPhone apps for Macworld, I’m reading, blogging and writing about politics elsewhere. The Good Blogs app has a section labeled “Democrats” and “Republicans” … and that’s all. Suppose you are politically independent or radical or simply curious. Or suppose you would rather not have your politics segregated so crudely. Sorry, I’m afraid you’re out of luck. Also, I couldn’t help but notice that some of the “Republican” blogs weren’t particularly Republican, but I’m sure that’s just a technical glitch. These things happen. And Good Blogs is limited in other ways. You cannot adjust text size, for example. Nor does the app support landscape mode, even when the Web browser is open. And Good Blogs doesn’t filter by language, so it’s often the case that foreign language blogs will pop up in your sample. Also, you cannot flag posts you like or might want to refer back to later. The blog posts often do not refresh as consistently or as often as advertised. The developer says: “Don’t see anything you like? Tap the Refresh button and get 10 new blogs.” But it ain’t necessarily so. So if, say, you don’t like the crop of blog posts that appear under “technology,” there is a very good chance that the same group will reappear when you refresh the screen. I suspect this has to do with the frequency with which Good Blog members post new material. But there should be a way to cycle in new material, even if that may entail pulling in older posts. Chances are, you haven’t seen it anyway. As it stands now, The Good Blogs Explorer has more vices than virtues, but I hold out some hope that good will triumph in the end. 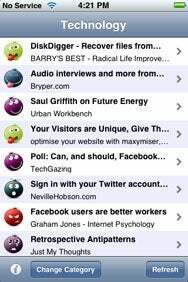 The Good Blogs Explorer is compatible with any iPhone or iPod touch running the iPhone 2.2 software update.